Juicer: Made from High Quality Materials, Build to Last The Prime life Smart fruit and vegetable juicer is made from superior-quality, virgin ABS plastic and durable stainless steel, making it ideal for daily use Featuring detachable parts. Gas trolley: High Quality Glossy(Chrome) Finish, Heavy Duty Stainless Steel 202 Grade Best Quality Wheels make it easily movable. No need to lift Cylinder. 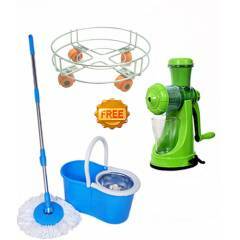 Navisha Assorted Steel Mop with Free Juicer & Gas Trolley, MOP0594 is a premium quality Wet Mops from Navisha. Moglix is a well-known ecommerce platform for qualitative range of Wet Mops. All Navisha Assorted Steel Mop with Free Juicer & Gas Trolley, MOP0594 are manufactured by using quality assured material and advanced techniques, which make them up to the standard in this highly challenging field. The materials utilized to manufacture Navisha Assorted Steel Mop with Free Juicer & Gas Trolley, MOP0594, are sourced from the most reliable and official Wet Mops vendors, chosen after performing detailed market surveys. Thus, Navisha products are widely acknowledged in the market for their high quality. We are dedicatedly involved in providing an excellent quality array of Navisha Wet Mops.